Craigmillar Castle is a relatively well preserved medieval castle, which is located close to Edinburgh in Scotland. Surrounded by a beautiful green garden tower, the remaining strongholds of Craigmillar lie only 4.8 km southeast of downtown. The low hill on which the castle is located lies slightly south of the same name today suburb of Edinburgh. The history of the castle Craigmillar began with the construction of the main tower, which still constitutes the essence of the fortress. The tower and the fortifications were built sometime around 1400, probably by Sir George Preston, who was heir of the Preston family. Members of this genus had played an important role in public life in Edinburgh for several hundred years. In 1440 the grandson of George Preston - Sir William Preston created the most outstanding feature of the structure of the castle Craigmillar. It stands outside the walls on three sides around the tower and the courtyard of the fortress. In 1510 Sir Simon Preston did build within Craigmillar further by adding additionall fortifications, outlining the boundaries of the beautiful gardens in the east and to the back of the fortress. In 1550, he had started another major expansion of the castle and built new buildings along the east side of the courtyard, whose purpose was to provide more conveniences to their owners than the main tower. 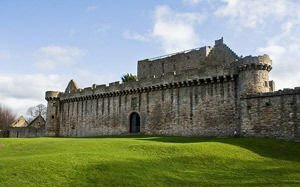 In September 1563 Queen Mary Queen of Scots stayed in Craigmillar castle and repeated her visit again in December 1566. It was at that time that the conspiracy to murder her husband - Lord Darnley was formed. In the 18th and 19th century the castle remains in ruins and 1949 it was transferred to the custody of state control authorities in Scotland. Today Craigmillar is open for tourist visits as guests of the castle are able to enjoy a walk in the now well-preserved structure and in the well kept courtyard. There is a possibility to climb to the highest point of the castle, which is the last level of the main tower where one can enjoy the breathtaking view of the surroundings. The inner courtyard has two large trees, one of which is named after Queen Mary and has a large role in the landscaping of the castle Craigmillar.